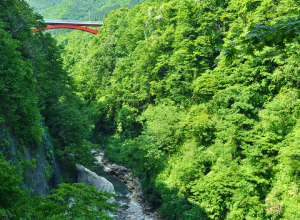 *The legend of Ono no Komachi lingers strongly in Yuzawa, so the Catchphrase of Yuzawa Geopark was derived from the traditional Japanese poetry at which Komachi excelled. The Japanese archipelago, situated on top of four tectonic plates, is a place where you can experience the long history of the Earth, and feel the activity of the Earth which continues to this day. 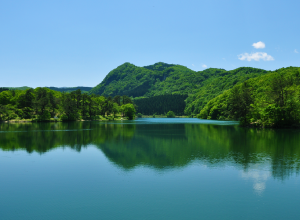 Yuzawa Geopark is located right at the center of Tohoku region. Due to the influence of the Sea of Japan and the Ou mountain range, which were created by the earth’s movement, combined with the effects of the Tsushima current, this is a region of heavy snowfall, the like of which is not seen elsewhere in the world. Why does life continue to go on in Yuzawa, this region of such heavy snowfall? 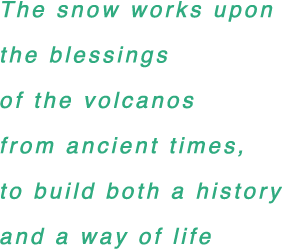 The clue lies in what we call “hidden volcanos”. In Yuzawa, from ancient times right up to the present day, the minerals, water and geothermal heat originating from volcanic activity, which we call the Earth’s blessings, have enabled us to develop industries and live prosperously in this land. Even faced with the changes happening around the world, and especially with overcoming the challenges presented by the changing Earth, we will continue to move forward and look to the future with the blessings of this rich land. Everyone, let’s seek out the hidden volcanos of Yuzawa. Geosites are areas where there are places to visit of geological, geographical, and historical interest, or museums and information centers, and which are characteristic of a geopark.In the Yuzawa Geopark area, 16 of such geosites have been established. The major geosites include Innai Ginzan (Innai silver mine), Takamatsu (Sanzugawa and Kawarage), Oyasu, and Akinomiya Onsenkyo. 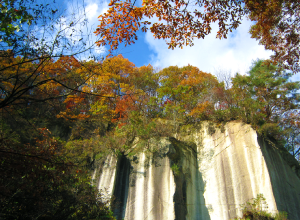 These noteworthy geosites in the geopark are spread throughout the city of Yuzawa, so as a result, the entire city is designated as Yuzawa Geopark. This area measures 790.72 km². Yuzawa Geopark is located in the southeasternmost part of Akita Prefecture, adjacent to the prefectures of both Yamagata and Miyagi. Located approximately in the center of Tohoku region, it is about 70 km as the crow flies to Akita City, about 80 km to Morioka City, and about 95 km to Sendai City and to Yamagata City. With National Route 13, 108 and 398 connecting it to both adjoining prefectures, it is the southern gateway to Akita Prefecture. Yuzawa Geopark had for some years been authorized to participate in the Japan Geoparks Network, and in July 2011 the “Yuzawa Geopark – Hometown of Beauty” initiative was formulated, to broadly show our preparedness for geopark activities within and outside the region, as well as providing a basis for a variety of activities situated in the geopark itself. We were then able to develop further activities based on this initiative. However, since the development of that initiative, more than 4 years have passed, and as a result of assessing the activities undertaken during that time, it was found that both vision, and plans for implementation, were shifting in direction. Furthermore, the number of National Geopark has increased dramatically; geopark activities have expanded nationally at the same time as global geopark activities, becoming part of UNESCO’s official programs; and the environment surrounding geoparks has been changing. With this backdrop to activities, it is a difficult context in which to continue with the same basic policy of “Yuzawa Geopark – Hometown of Beauty”. Based on the results of the activities of Yuzawa Geopark up until now, we decided to formulate a new vision statement as the cornerstone of future activities. 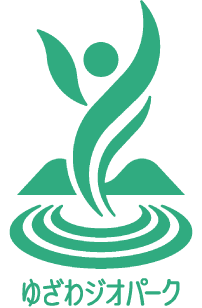 This statement shows Yuzawa Geopark’s vision of the future, which is to aim for official inclusion in the Global Geoparks Network; setting goals and defining the plan for activities which need to be undertaken to attain this vision of the future. Furthermore, bringing together, as one, the local community and government organizations, to promote geopark activities based on this vision, and to continue to sustain a vibrant community. The formation of the geographical features of Innai is deeply connected to the volcanic activity that occurred here. Three massive volcanic eruptions took place here between 8 and 6 million years ago, forming the Innai caldera. This volcanic activity also caused the formation of the Innai tuff (Innai Rock) and the vein of ore of the Innai silver mine. Innai Ginzan (Innai silver mine), with its rich vein of silver ore, was in the latter half of the Edo period (1603-1868) the greatest producer in terms of volume of silver in the whole of Japan, so it was named “Tenpo no Sakariyama”. This vein of silver ore can be deduced to be resulting from the volcanic activity that produced the Innai caldera. One of the leading silver mines of the country, around 350 years passed from the time of discovery until the closure of the mine. Ono no Komachi, a female poet from the first half of the Heian period (794-1192), was reputed to be one of the world’s three most beautiful women. There are several theories as to her birthplace, but the one that she came from Ono in the city of Yuzawa has become mainstream. 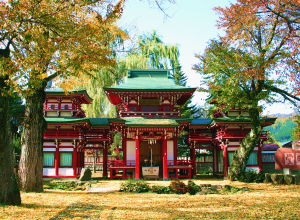 In the Ono and Yokobori areas, there are many legends, temples and historical sites associated with Komachi. In the Yakunai area, you can see the rocky outcrop of the most ancient strata of granite rocks in Yuzawa, formed during the second half of the Cretaceous period (about 97 million years ago). 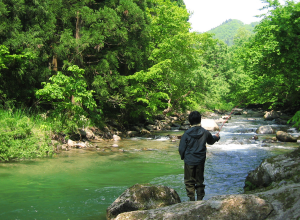 Where the Yakunai River meets the O-yakunai River, lies the location that the live-action movie of the manga Tsurikichi Sanpei (Fishing Enthusiast Sanpei) was filmed. This manga was the masterpiece of artist Takao Yaguchi, who was born in Akita Prefecture. Akinomiya Onsenkyo (hot spring village) has four varieties of hot spring with about 40 points of source. 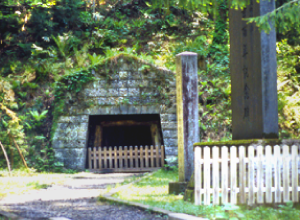 Located on National Route 108, in the direction of Miyagi Prefecture, (Onikobe Pass), it is said to have been discovered by the Buddhist priest Gyoki during the Nara period (710-794). 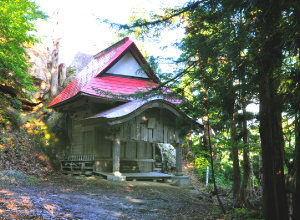 We know from a traditional document which has been preserved since 1702, that Shingoroyu was opened in that year, so it is the oldest hot spring area in the prefecture. To explain the history of the Sanzugawa environs, around 7 to 3 million years ago a large-scale volcanic eruption occurred, creating an enormous caldera lake about 10 km across from East to West, and 20 km across from North to South. However, it is said that this lake has since been covered by the volcanic debris produced by eruptions of volcanoes such as Mt. Kabuto and Mt. Takamatsu, causing it to disappear, and giving it the appearance that it has now. 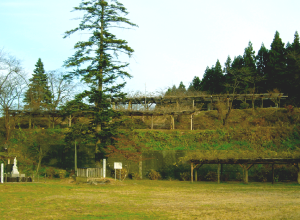 In Takamatsu, Jomon ruins are to be found around the facility Geosuta☆Yuzawa. Cosmos flowers are planted along Prefectural Route 51 as part of green space activities, so the road is also known as Cosmos Line. 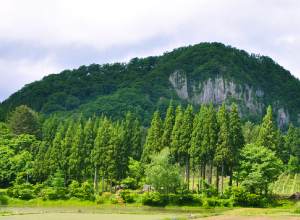 The Okuoyasu area which borders with Miyagi and Iwate prefectures, has abundant nature and ancient forests stretching across mountains such as Mt. Kurikoma. The old Oyasu Road, Hanayama Pass, and Mojigoe were from ancient times important strategic points on travel and transport routes. Traces of the forest railroad which ran until around 1965 remain ahead of Oyu hot springs. 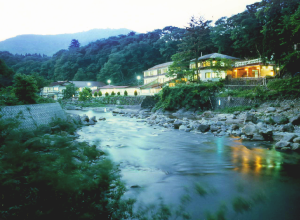 Oyasu-kyo hot springs is located in the mountainous region, abundant in nature, that stretches from Mt. Kurikoma to Kijiyama Highland. High temperature steam and hot water burst from the ravine at Oyasu-kyo, allowing you to feel the powerful force of the Earth’s vitality. In this area, geothermal resources are actively put to use, with the best examples being the cultivation of agricultural produce in warm greenhouses, and the processing of dairy products. The valley is famous for the beauty of the fresh green of early summer, and the colored leaves of autumn, so it is thronged with many tourists throughout the year. Minase is an area with many lakes and marshes. A steep slope draws a gently curving arc behind these lakes and marshes, and since it is common for boulders and stones to roll down from points around here, it is believed that all these lakes and marshes were formed as a result of landslides, occurring after the volcanic activity that took place here in the past. There is also a man-made dam nearby holding back the large volumes of water of Minase Dam, so it is truly a village connected with water. 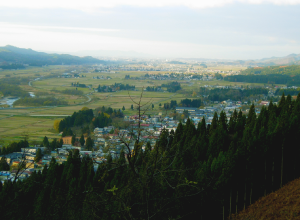 Inakawa is a town that was established along the fluvial terraces of the Minase river basin. This region is steeped in history and culture that has remained rooted here since the rule of the Onodera clan, resulting in the continued flourishing trade in traditional products such as Kawatsura lacquerware and Inaniwa udon noodles. 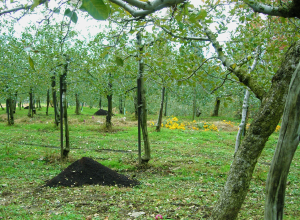 There were three mines in the Komagata area that produced silver and copper; Shirasawa mine, Raiden mine and Okura mine, but all three are now closed, and a fruit orchard has been established on the site of the ruins of the Shirasawa mine. The geology around the mines consists of tuff dating from about 23 million to 5 million years ago. There is also a Kannon statue with connections to covert Christianity, that remains in a temple near to the mine. Tsubakigawa town (now Kawabe, Akita City) was conferred to the Ikinokami clan, a scion of a branch of the Satake clan during the Boshin War in 1868. 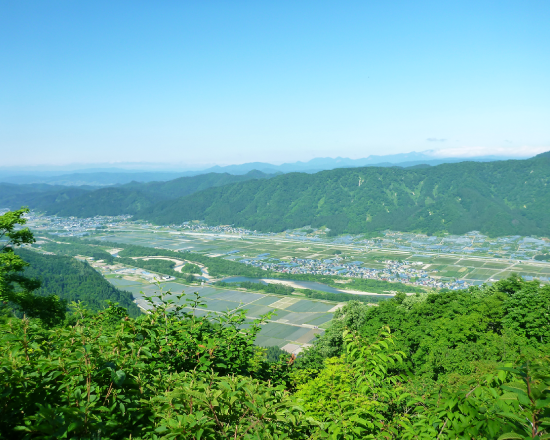 However, as the land was impossible to defend from an enemy attack, the seat of rule was moved to Ogachi district in 1870. 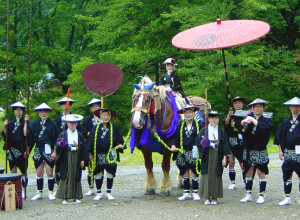 Subsequently, the expansion of the clan rule led to the Iwasaki region being formed. In 1871, the Meiji government abolished the han-system in the Empire of Japan, replacing it with a new system of prefectures, and Iwasaki Prefecture was formed, although later in the same year it was subsumed into Akita Prefecture. 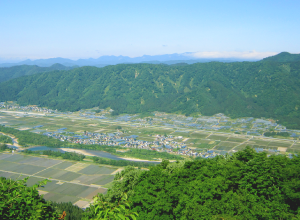 Yamada district has the largest area of rice paddies of any of the districts of the Yuzawa area, producing around 400 tons per year of rice for use in making sake. The Matsuoka mine that once operated here produced “Yuzawa silver”, renowned for its quality and mined by 400 miners at its peak. 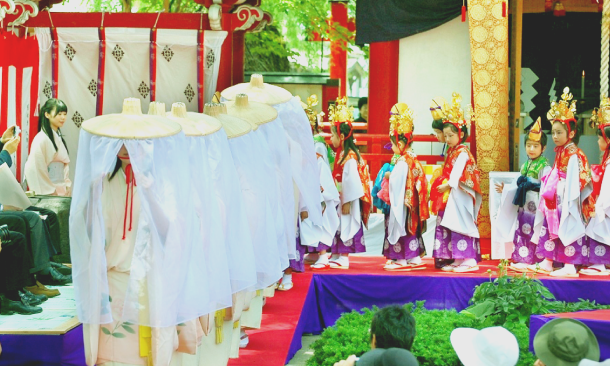 The area is also known for its religious faith, with a shrine established in every community as well as temples founded. 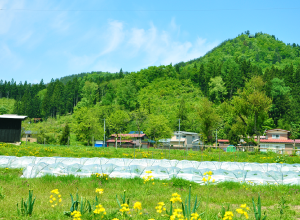 In the districts of Mitsuseki and Sukawa you can see many small, fan-shaped stretches of ground, a topology that has been put to use in the cultivation of crops, such as cherries and Japanese parsley, since times long past. In addition to this, the stone quarried in this area has been used historically in the production of statues of the Buddha and tombstones, so the district is known for its stone processing. Surrounded by mountains of an altitude of 800 m or more, the city of Yuzawa is situated in an area that experiences heavy snowfall. 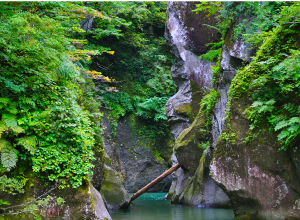 Due to the capacity of both the volcanic rock and the forestation to retain the water from the melted snow of the mountain peaks, there is a great proliferation of water springs, with more than 29 named sources of spring water recorded in Yuzawa City. This spring water is used in the local sake industry, as well as in the precision instrument industry. Copyright (C) 2005 YUZAWA City. All rights reserved.